Georgia's favorite small brewery has made a gose with cucumber, salt, coriander and lime that smells like a margarita. The lime is present, the salt sticks to your lips and the cucumber adds a sort of savory element. And it's barely sour at all. Overall, an easy drinking, refreshing gose (and just 4.5%). Deschutes takes a simple approach to the wheat beer, delivering an easy-drinking ale with an incredibly soft mouthfeel (thanks flaked wheat!) and a light, lemony finish. A double IPA for summer drinking? Why the hell not. Maui's blood orange IPA is frothy and delicious with a bitter bite on the finish. The blood orange is understated in this beer--think more orange peel than orange juice--which might disappoint some who are looking for a juice bomb, but we dig the bitter take. It's 8% ABV, so be careful. Virginia's Starr Hill uses real lemon and lime zest in this wheat beer, which carries a bit of spice in the sip. It's a classic Belgian take on the style, with a little fruit added in for fun. Cause, you know, summer. This is the best radler I've had this year, and that's saying something because I've had a lot of radlers this year. Austrian-based Stiegl mixes their Goldbrau with lemon soda for a refreshing, zesty beer with a bit of ginger kick. Plenty of lemon, plenty of carbonation, plenty good, and super-sessionable at 3.2%. This is an old beer that Widmer Bros brought back this year. The pale is well-balanced, and shows off the Summit hops, while delivering a beverage that goes down so damn easy when you're sitting in the sun on your back porch. Or so I've heard. The temperature has officially risen, you’re working out the details of your first beach trip, people are putting slices of orange in their hefeweizens…summer is here. And that means you need to refresh your beer routine. It’s time to stock the cooler with easy drinking pales and effervescent wheats. 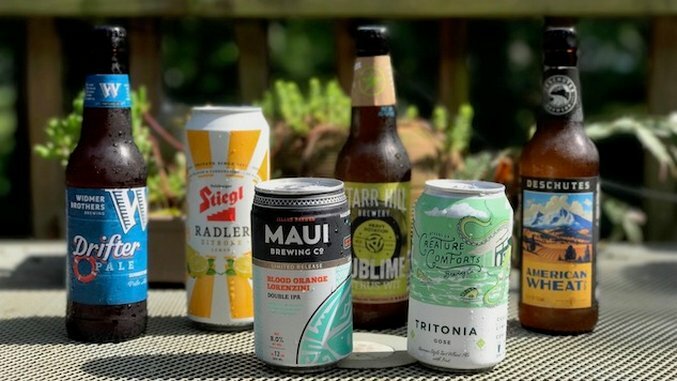 We’ve designed a six pack perfect for summer drinking, full of lighter, beach-friendly options and a solid double IPA to boot. Just because the mercury is spiking doesn’t mean you abandon your love of big, bold IPAs, right? Check out the gallery for a summer sixer.